Your lawn should be mowed on the highest setting. The best setting is 4.5 – 5 inches. Make sure you measure from the bottom of the blade, not the deck. You don’t want to cut off too much grass at one time. It’s best not to cut more than one-third of the blade’s length at one time. Otherwise this may damage the lawn. For example, grass that is 6 inches tall should have no more than 2 inches cut in one mowing. Since the grass blades process sunlight, if you were to cut off too much it would be as if you cut their energy source in half. Why Should I Keep My Grass Taller Rather Than Shorter? The taller the grass is, the more sunlight the grass will receive. This creates more photosynthesis activity. The longer grass blades will also create more shade which cools the soil and reduces evaporation. Also, longer grass blades will shade seeds from other plants like weeds and help prevent them from germinating. In general, this reduces the amount of stress put on your turf. When grass is cut too short it is more likely to be damaged by insects. What About Lawn Mower Blades? Remember that having sharp blades on your lawn mower is a must. When grass is shredded by dull blades it allows fungus to enter into the healthy grass blades similar to how an open wound is prone to infection. Can I Mow My Lawn When It’s Wet? Safety – You could easily slip and/or injure yourself with the lawn mower’s blade. Jagged Cuts – Since your lawn will not be in the best mowing state, the cuts will not be clean. 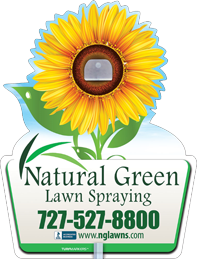 Lumpy Lawns – Lawn clippings can clump together making your lawn lumpy in appearance. Grass Stains – When chlorophyll from grass is wet, it is known to stain almost everything. This can range from your clothes, to your driveway or even the house if the clippings are blown up against it. Clogged Lawn Mowers – Wet grass becomes sticky. Since it’s wet it could stick to the underside of your lawn mower’s deck or even clog the motor.